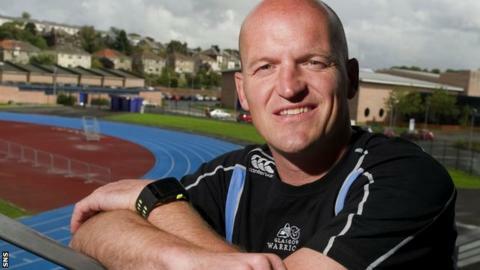 Head coach Gregor Townsend believes Glasgow can mount a serious challenge for the RaboDirect Pro12 title. "We want to improve on last season," Townsend told BBC Scotland. "We want to improve on every game and every training session. "We certainly want to be top of the table come the end of the season. "Teams will respect Glasgow and realise what our strengths are. We have to overcome that, be accurate and make sure we deliver 80 minutes every week." Glasgow made the play-offs last season after finishing the campaign in fourth-place; 16 points behind Leinster at the top. Townsend, who has replaced Sean Lineen at the helm, will be without Richie Gray's towering presence but the Warriors have added some notable new recruits, including Sean Lamont, Angus Macdonald and Nikola Matawalu. "There is expectation from the supporters and from this group of players," added Townsend. "Those that didn't get selected this weekend want to be part of the team, so it's about managing that. "Also, it's about managing what opponents do against us." Much of Glasgow's success last term was down to defensive grit and Townsend is not about to change a winning formula. Indeed, the former British & Irish Lion is looking to improve on it. And he will be aided by Matt Taylor, who has left the Queensland Reds to take up the role of defence coach with Glasgow and Scotland. "Winning rugby is about being tough to beat," explained Townsend. "Having an outstanding defence but also not turning over the ball, especially in your third of the field, which tends to lead to tries and penalties. "Having those two things in place will make us tough to beat. That's what was built up last season and we've looked at improving those areas. That will be the foundation of how we play." Townsend has chosen not to tinker with the the choice of leader at the Warriors, with lock Al Kellock continuing as skipper. "He's one of the best captains I've seen, an exceptional leader on and off the field," said the head coach. "He's very good at gauging the mood of the group; whether to add more energy or take it down a notch. "He's also an intelligent game manager. He knows when to change from the game plan and take control of things on the field." Glasgow open their account with a trip to Ulster on Friday. "It's a very tough opening game for us," said Townsend. "Ulster have a very good home record and they will be full of confidence. "For me, they were the form team in Europe between Januaray/February and April; getting to the final of the European Cup was an amazing achievement. "Out of all the teams we will play this year, they probably have the fastest line speed. That gives you counter-attack ball because it will force teams to kick, it also produces turnover ball if the opponent is not accurate in attack. "But we have a strategy to combat that and I'm confident with the squad I've got."